Shovel Knight has been a title that has been anticipated from fans that loved the difficulty of the NES games. Those NES games pushed the systems limits and trickled as much as possible with the technology developers were required to tamper with. Thankfully, Shovel Knight is a title that delivers with its brutal difficulty. During my play through of the game, I was charmed to see classic references the game packed, not necessarily with the dialogue it contained, but the roots of the game. Off the bat, you’ll notice the map you use to select the levels looks fairly similar to the Super Mario Bros. 3 stage selection screen. Hence, it even contained those pesky enemies you had to defeat through the map in order to pass to a certain level. 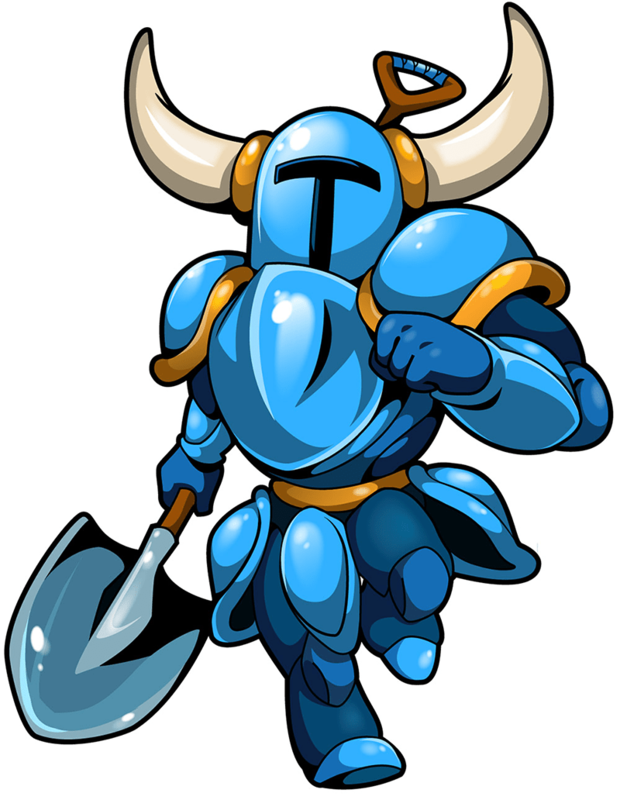 In the case of Shovel Knight, instead of Hammer Bros., you’ll sometimes have to battle some miscellaneous mini-bosses or a possible Knight that’s trying to defeat you. And in rarer occasions, instead of an enemy, you’ll see a red gem on the screen, and once you reach it, it takes you through a stage you must scroll and collect money for your own use, with the possibility to collect a hefty amount of moolah. The gameplay is rather clever. Sometimes, when I was moving along the stage, I would find an alternate path in a very secretive area where I wasn’t expecting it to be. I would be rewarded with a chest full of money or a shorter path to a checkpoint/boss, but with the path to getting their being more challenging due to enemies clobbering my Knight with their items being thrown at me. If you love the challenges the Mega Man series delivers, you’ll love what Shovel Knight has to offer. In fact, you sometime seem to make the silliest mistakes in some rather easy parts. If you daze off and let loose your attention towards what’s in the screen, you may end up killing yourself or dealing a load of health lost. For example, a stage where it’s easy very to die is the Iron Whale stage, which certain parts are filled with spikes on the top and required timed jumping in order to survive. At times, you may also have to be extremely skilled at certain stages hazards. You may have to use your shovel downwards and time each jump carefully or else it’s back to the checkpoint. So will this game grind your gears? Yes. Should you hate it because of that? No. In this case it’s possible to have both aspects and combining them into one. You’ll hate it so much due to the difficulty the game has, but love it due to how fun everything is. Whether it’s kicking the enemy’s butts or finding a secret chest, you’ll painfully love every moment. How hard can the game get? It depends on you. You can customize various aspects of your Knight as well as the abilities you’ll have. You can upgrade your health meter to a higher amount if you so choose to do so by acquiring meal tickets, which make your health rise by 1, or upgrade the armor your Knight has, enhancing certain fields where it’s to your advantage, in example, you can have a higher defense, but you’ll sacrifice the ease of your character being able to stop easily. Another aspect for players love challenges can excel is at the checkpoints. Yes the checkpoints. What exactly do I mean? Well, if you feel brave and (possibly) cocky, you can destroy a little jar in the checkpoint pole giving you a batch of money, but if you end up dying and not making it to a new checkpoint, you’ll be sent back to the last checkpoint you past (before the one you got to) or to the beginning, depending if you destroyed the previous poles. And lastly, let’s not forget the humor Shovel Knight has to offer. I was surprised to see how a game can be so good with its gameplay mechanics and have a good humor as well. You’ll see evidence of this in the game from the beginning of the game where a guard is mocking you due to being a hero with only a shovel to parts where bosses make fun of you due to your small size. If you love old school 2D platformers as well as awesome soundtracks, Shovel Knight is the way to go. You’ll get an enjoyable experience. Shovel Knight is available now on the Wii U eShop as well as the 3DS eShop in North America.